Last month, a chance trip to Leeds meant that I found myself in the city with a friend looking for somewhere to eat. We found Carluccio's and decided to grab something to eat there before I got my train back home. We have a Carluccio's close to home and I have eaten there a couple of times before, so I was quite confident that I would have an enjoyable meal. It was early evening when we went and so the restaurant was quite quiet. We were greeted and shown to a table efficiently and with a smile. The regular menu was running, along with a two course special menu. The atmosphere was really welcoming with low lighting, candles burning and a flower on the table. The restaurant was clean and modern and you could see the chefs cooking in the kitchen. There was lots of space between tables so you didn't feel too encroached upon and my friend and I ordered drinks and settled down for an enjoyable meal. I ordered from the two course menu priced at £9.95. My first course was Bruschetta - described as "fresh ripe tomatoes with oregano, basil leaves, roasted peppers and extra virgin olive oil on garlicky italian bread". If I were being extremely pedantic, and as you can see from the picture, I was served rocket leaves rather than basil, but I am a big fan of rocket and so this didn't bother me and I really enjoyed my starter. The flavours all merged really well together and the balsamic reduction on the rocket salad really complemented the rest of the dish. 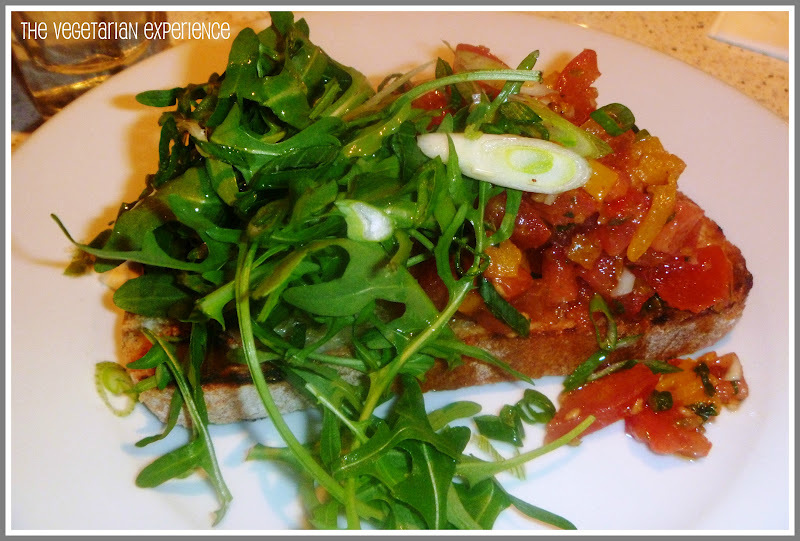 I can definitely recommend the Bruschetta! 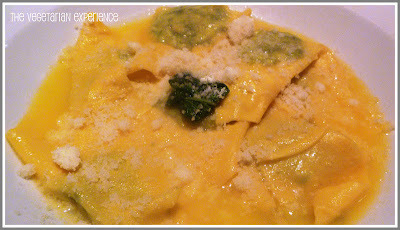 For main course, I chose the home made Ravioli filed with spinach and ricotta, served in the traditional way with butter and sage. The fresh filled ravioli was really delicious, but the sage and butter sauce ruined the dish as it was quite watery and the taste was a bit overbearing - perhaps a tomato sauce would suit the dish better. The service we received during our meal wasn't horrendous, although I felt that our server didn't particularly make an effort and stuck to doing the bare minimum rather than going the extra mile. We had to wait quite a while for drinks when we ordered more part way through our meal. The service varies between branches and I have received better service in the St Albans branch than I received in Leeds this time. All in all, I think that Carluccio's is really great value for money - especially their fixed price menu. They have some lovely vegetarian breakfast items and small italian plates to choose from, although their starter and main course choices are limited for vegetarians. I could only find Bruschetta as a vegetarian starter on the main menu, and "Pasta Con Funghi" as a vegetarian main course. So a very limited choice if you are a strict vegetarian - although there are a few other cheese dishes if you are prepared to be a bit more flexible and eat parmesan, mozzarella or gorgonzola. There is also a goats cheese salad. A small observation I would make is that items are not listed as vegetarian on the menu, so you really have to examine the menu to decipher what is and what is not vegetarian. A simple "V" to denote vegetarian food would not go amiss on the main menu. I would also like to see some more variety and choice of vegetarian dishes available. Additionally, Carluccio's do have a Gluten Free menu with lots of options to choose from, and a Childrens menu charged at £6.50 per child offering a couple of different vegetarian options. I really like Carluccio's, they are great for a family meal, or for a night out with family or friends. The quality and freshness of the food is good and the restaurants are pleasant to dine in. If you are a vegetarian, you will be able to find something to eat, even if you have to scout around the menu to find it, and if not then maybe consult the chef to see what they could come up with for you. Price: The Daytime menu is competitively priced, as is the rest of the menu- 9/10. Ambience: Lovely restaurant, very clean and welcoming, great ambience. I like the low lighting but could feel a little dark for some. 9/10. Service - The service wasn't amazing. Our server did her job, but there was not much passion or effort, it felt like she didn't really want to be there. 6/10. Food - The food is freshly made, my Bruschetta tasted amazing and so did my Ravioli, although like I said the sauce didnt really hit the spot for me. For quality, taste and freshness, I would award a 9/10, but because I felt that there were not enough options for vegetarians on the menu, and they were not clearly marked, I am going to give an overall score of 8/10. Overall: 32 Points = 8 out of 10.